THE SUPPOSED NARRATORS OF THE HEPTAMERON TALES. In her preface, Marguerite de Navarre says that unlike the Decameron, on which her work is modelled, the tales are based on actual events and real people. The names have been changed and so clues to whom the author was alluding must be gleaned from the stories themselves and in some cases the resemblance of the character's names to real life persons. The fact that the stories, which are often bawdy and scandalous, might actually be based on real people and actual events has proven to be a titillating prospect for historians and literary critics. Many attempts have been made to uncover the true identity of the characters based on clues found in the Heptameron. However, in most cases, there is no consensus and there are many possible solutions to the mystery. OISILLE: The character of Oisille, an older widowed lady and unofficial mentor of the group. She is thought by some scholars of the Heptameron to be Louise of Savoy. In some manuscripts of the Heptameron, Oisille's name is spelled "Oysyle", which could be an anagram of Loyse, the old French spelling of Louise. PARLAMENTE: Parlamente is the wife of Hircan. 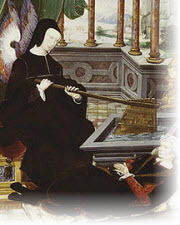 The prevailing opinion is that Parlamente is the author, Marguerite de Navarre, herself. This theory is based primarily on the similirity between Parlamente's position on various subjects such as religion and philosophy, and those held by Marguerite de Navarre. HIRCAN: Hircan is the brutish husband of the character Parlamente. Following the logic that Parlamente is the author, many commentators on the Heptameron have concluded that Hircan must represent the author's real life real life first husband. However this opinion is not univerally accepted and some critics identify Hircan with Henry d'Albret, King of Navarre. This belief is based on the fact that the name of Hircan may be derived from Ilanricus, an old way of spelling Henricus. It might, however, also come from the Latin word hircus, a he-goat, for Hircan is a man of gross, sensual tastes. LONGARINE: A young widow. She is believed by some critics to represent Blanche de Chastillon, n�e de Tournon. However others think she is Aim�e Motier de la Fayette, lady of Longray, widow of Francis de Silly, Bailiff of Caen, and gouvernante to Queen Margaret's daughter, Jane of Navarre. Longarine may also be Aim�e Motier de la Fayette's daughter Frances, married to Frederic d'Almenesches, of one of the branches of the house of Foix. SIMONTAULT: Simontault (sometimes occasionally spelled Symontaut in the book) is a young knight, thought to be Henry d'Albret, Margaret's second husband, who was of an extremely amorous disposition, and much younger than the Queen. Heptameron. ENNASUITE: Ennasuite (occasionally spelled Ennasuitte or Ennasuicte, and in some manuscripts. Emarsuite), is supposed to be Anne de Vivonne, wife of Francis de Bourdeilles and mother of Brant�me. It is pointed out that the name may be transformed into the three words Anne et suite. DAGOUCIN: Dagoucin is a young gentleman who is thought by M. Frank to be Nicholas Dangu, who became Chancellor to the King of Navarre. Others believe that he is the Count d'Agoust. GEBURON: The character of Geburon is an elderly gentleman in the Heptameron. He may represent Seigneur de Burye, a captain of the Italian wars to whom Brant�me (his cousin-german) alludes in his writings. The name of de Burye is also found in a list of the personages present at Queen Margaret's funeral. NOMERFIDE, so M. de Lincy suggests, may have been the famous Frances de Foix, Countess of Chateaubriand; but M. Frank opines that she is a Demoiselle de Fimarcon or Fi�dmarcon (Lat. 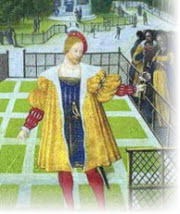 Feudimarco), who in 1525 married John de Montpczat, called "Captain Carbon," one of the exquisites of the famous Field of the cloth of gold. Miss Robinson, however, fancies that Nomerfide is Isabel d'Albret, sister of Margaret's second husband, and wife of Ren� de Rohan. SAFFREDENT, so M. de Lincy thinks, may be Admiral de Bonnivet; M. Frank suggests John de Montpezat; and Miss Robinson Ren� de Rohan, who, after his father Peter de Rohan-Gi� (husband of Rolandine, see ante, vol. 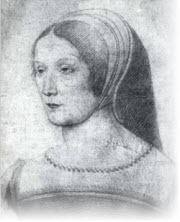 iii., Tale XXI, notes 2 and 15), had been killed at Pavia, was for some years entrusted to Queen Margaret's care. As Miss Robinson points out, Saffredent literally means greedy tooth or sweet tooth.